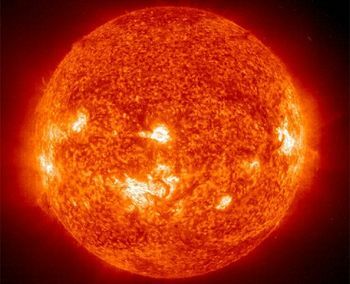 Angeles Duran did not say how much she was going to charge people for using the Sun, but she did confirm that she owns it, that her claim is legally valid, and that she will be charging a fee. Duran, a 49-year-old Spaniardess, said she had registered her claim with a local notary public and now owned the Sun free and clear. The document reportedly declares that Duran is the owner of "the Sun, a star of spectral type G2, located in the center of the solar system, located at an average distance from Earth of about 149,600,000 kilometers." So if that's the same star you have been freeloading off all this time, get prepared to ante up. now you owe Angeles Duran money. Duran said she got the idea of staking a claim to the Sun after reading about an American man (probably Dennis Hope) who had registered himself as the owner of various other nearby objects, including the Moon. Duran realized that he had, astonishingly, neglected to claim the Sun itself, and off she ran to her local notary public to seal the deal. She is now the proud owner of what is currently the most valuable stellar object in the universe. If only you had been paying attention, this could have been you. "I did it," Duran said, "but anyone else could have done it. It simply occurred to me first." And don't think she didn't do her homework before dashing down to the notary public's office. Duran said she is aware that there is an international treaty that precludes ownership of extraterrestrial objects, but said the treaty applies only to countries, not to their individual citizens. "I backed my claim legally," she said. "I am not stupid, I know the law." Not coincidentally, the "treaties-don't-apply-to-citizens" argument is also the one made by Hope about the problem of the 1967 Outer Space Treaty. At least according to a source quoted by National Geographic, namely the International Institute of Space Law, that treaty does indeed apply to private citizens as well as the countries they live in. This has not stopped Hope from selling plots of lunar real estate – or at least deeds saying you own a plot of lunar real estate – to millions of people (including this guy in China) over the past thirty years. But it does mean that neither he nor any of his customers actually own any of it. On the other hand, said the IISL, it is not always necessary to actually own something in order to make money from it, as long as you have some legal right and the practical ability to do so. Both of those might pose some problems with respect to the Sun, however. "It is time to start doing things the right way," said the woman who had just filed a claim to the Sun with her local notary public. Duran said she was acting in the time-honored tradition of the entrepreneur. "If there is an idea for how to generate income and improve the economy and people's well-being, why not do it?" Yes, but maybe brainstorm it a little bit first?